It is quite difficult to find good information on park models. 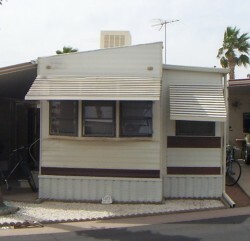 After a lot of searching we have located some sites that provide information but even those tend to be more generally about mobile homes and/or recreational vehicles. much higher with a lot of extras. in the park itself ... with an assigned lot. The park models all start out at about 400 square feet. But then a storage room gets built and maybe an Arizona Room. 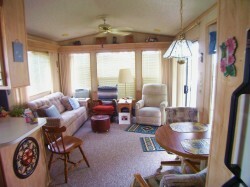 There are all kinds of creative modifications done to enhance the living space. The climate allows for some pretty basic enclosures to be added that functionally serve as an addition to living quarters. But still generally retain the legal status as a vehicle. 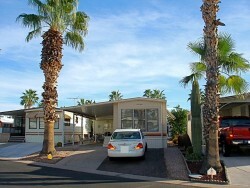 Park models in Arizona cannot exceed 400 square feet if they are to benefit from vehicle status and not be subject to standard residential taxes. residence. It still has wheels and can be moved. The diagram shown here is a very typical park model design. This layout is very common, at least before any modifications or additions. or Arizona room. They are well designed and make good use of the space available. The common width is 12 feet so the length is normally just over 30 feet. But there are still some that are narrower. 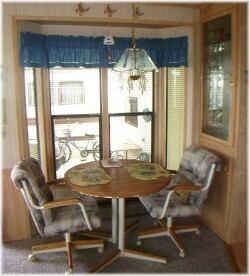 Some very old units are only 8 feet wide and tend to resemble a standard older traveling trailer. Then additions were designed to expand to a 12 foot width. That resulted in what is called 'slide outs' or 'tip outs'. of the trailer and some less. most park models a full 12 foot wide. at the left are commonplace. Then there are the 'higher end' units that have been added to and modified. These tend to be more common in the resident-owned parks (but not exclusively). The owners in these parks have a much higher investment and monies spent adding to the unit represents a far smaller percentage of the unit total cost and possibly less risk. 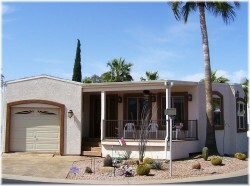 A variety of modifications and additions have added a lot more space and may even include a regular attached garage. The end result is some pretty elaborate set-ups for what began as a 400 square foot park model. 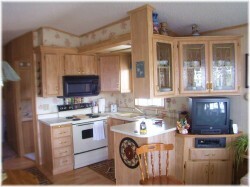 The kitchen setup makes good use of space and generally there is ample cupboard space. Most units also have some type of china cupboard and extra storage. The appliances are pretty well what you will have at home with possibly one exception. Propane is not uncommon. possibly additional storage in this area. patio area or Arizona room. at least compared to todays large facilities in many homes. But they have come a long way from those tiny old travel trailer bathrooms. dedicated to double closets and drawers. Nearly all the park models sit on a lot that provides anywhere from about 15 to 25 feet of side yard. 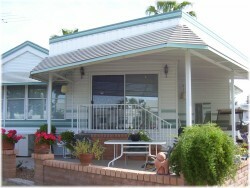 Normally that side yard is covered 'patio style' and serves outdoor living and vehicle parking. Some parks have deeper narrower lots allowing parking in the front while others are wider and allow parking at the side. An important part of the park model. When you consider the limitations on unit size the storage shed becomes far more valuable than your old shed in the back yard at home. A storage shed is common fare and they are usually about 8X10 feet or larger. They are extremely valuable, especially when you consider you have no basement and the unit size is limited. In fact I don't know what you would do without one. The storage shed is rarely just a place for storage. Of course they are used for storage but the creative uses are pretty wide ranging. 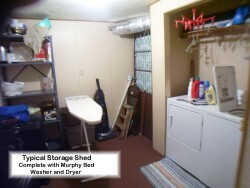 They are a natural location for a workbench and a common use as a place for your own washer and dryer. But sometimes larger sheds are almost used as extra living quarters ... TV or computer rooms and even the odd one with a mattress for extra visitors. Although probably against some rules they do tend to serve in an emergency. 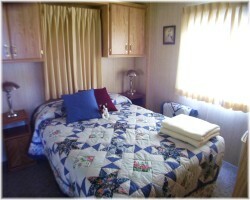 It seems every park model has a sofa bed (or whatever they are called in your area) to accomodate extra guests. They are pretty well standard fare in the living room. And just as common in the Arizona Room. Visitors are common in the parks and it is easy to tell when it is 'spring break' or (naturally) Christmas and other holidays. The kids and grandkids come to visit. And of course friends from 'back up north' will visit to experience some winter getaway. Most parks have a variety of plants and some lots may have small growing spaces. 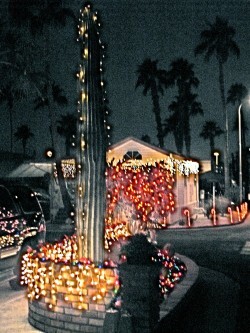 And of course there are the Citrus Trees, Palm Trees, and the Cactus. Breakfast in the Back Yard? The citrus trees are commonplace throughout the parks. 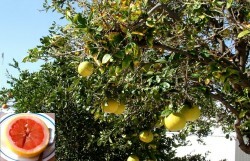 It is quite common for a lot to have mature grapefruit and orange trees. for breakfast. But that is pretty normal for many RV park residents. trees, a common site in the parks. Palm Trees and that may be it. And the cactus is also a symbol. 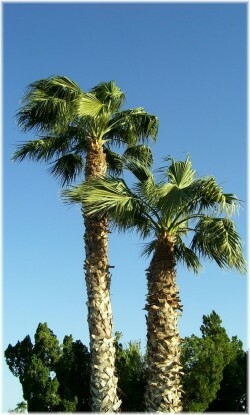 It is a symbol of the desert. There are many varieties, some only found in desert locations. They are a common fixture on RV lots. There are wonderful cactus blooms in the spring and they certainly add to the flavor of the desert location. A couple key items to look for are the condition of the roof and the floor. Roofs are most vulnerable. They can certainly be prone to leaks and weakened by previous water damage. Older park models came with metal roofs and a common site is an old roof with patches over patches. Newer units have traditional shingled roofs and are really not much different than your normal house roof. Floors can become weakened from previous water or termite damage. What seems like a simple floor squeak can be a sign of bigger problems. It is a good idea to have a look under the unit to see the condition of the floor. Electrical wiring can be somewhat less than up to normal household standards as well. Again, this can be more of an issue in older units where modifications may have been made over the years. Plumbing in park models is often done using plastic water lines and over time some of this older plastic becomes hardened and can easily break, especially at or near joints. 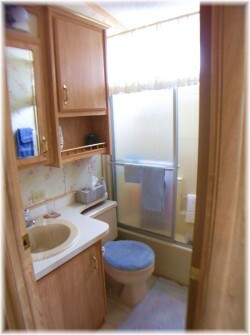 Plumbing is usually not that hard to access and lines can be repaired and even (quite easily) updated. Another common issue in the Phoenix area is the termites. They can really wreak havoc with a park model. They are common and if the owner hasn't done proper prevention they can infest the unit. If you are not familiar with what to look for it may be a good investment to have an inspection by a pest control company. Heating and cooling equipment should also be examined closely. There are a few differences in what is used in park models and this can impact your operating costs. Cooling is by central or window air conditioners and an item we had never heard of before, the 'swamp cooler'. Swamp coolers are most common in much older units and are quite a reliable and inexpensive method of cooling. But they only work in very dry climates. Swamp coolers use water evaporation to provide cooling that is then blown throughout the trailer. The best explanation I heard to describe the concept is to imagine putting on a wet t-shirt on a hot day and then blowing yourself with a fan. The rapid evaporation of the moisture provides considerable cooling effects.